Also known as "Le Tibet : chant d'exil"
"A land of snow and mountains, of burgundy-clad monks and prayer wheels -- this mythical image of Tibet hides the tragedy of a forgotten people. Since the invasion of their territory by China some forty years ago, Tibetans have been struggling for cultural and political survival in a world surprisingly indifferent to their plight. Filmed in the Indian Himalayas and in Canada, A Song for Tibet tells the dramatic story of the efforts by Tibetans-in-exile, including the Dalai Lama, to save their homeland and preserve their heritage against overwhelming odds." National Film Board of Canada. 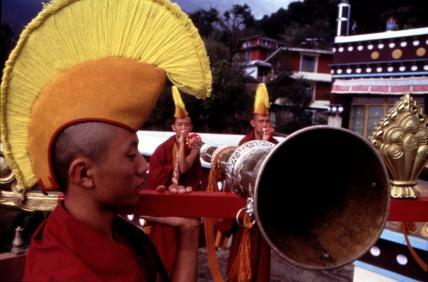 "NFB -- A Song for Tibet." National Film Board of Canada. http://onf-nfb.gc.ca/en/our-collection/?idfilm=26013.